Have you ever read those claims in beauty magazines that women eat an extraordinary amount – we’re talking pounds – of lipstick over the course of their lifetimes? Snopes has thoroughly debunked this myth, but still, it recently got me thinking. This month a journal I regularly read (Fertility and Sterility, which has a slightly lower circulation than US Weekly, let’s be honest) had a special issue about environmental toxicants and their impact on reproductive health. One article focused solely on cosmetics. While there wasn’t conclusive evidence that specific chemicals in products we routinely apply to our skin/face/lips cause problems like infertility or early menopause, there were questions about their safety. 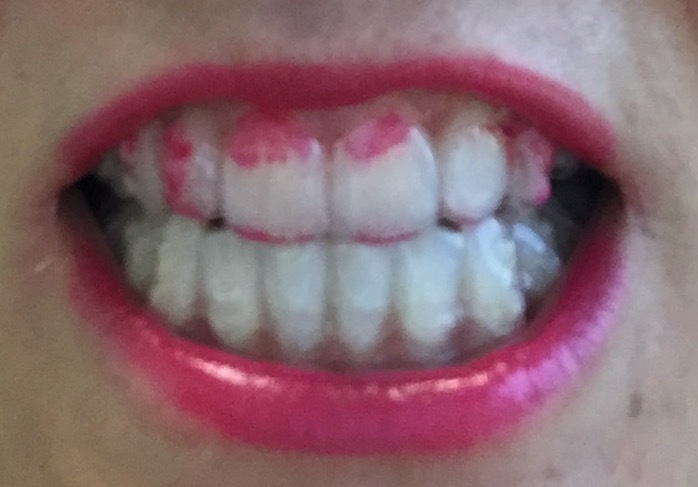 Since I started using Invisalign braces about six months ago, I saw firsthand how much lipstick I get on my teeth. The Invisaligns show off every speck. A few months ago I was introduced to Beautycounter, a brand that is all about safer beauty, free of toxic chemicals. Check out their list Never List of ingredients to avoid. I haven’t made a full commitment to green beauty yet, but I purchased a Lip Sheer in Coral and a Gloss in Peony. Both of these are terrifically creamy formulas with good staying power and a nice feel. And it’s making me feel better about all that gloss on my teeth. P.S. Right now, Beautycounter has a special collection available at Target. Check it out!